Today I'm writing about a Multimedia Program called 'Songbird' developed by Mozilla (heard the name of Firefox?). This player is very stable and constantly putting on new features on each release. The feature of this program is that we can enhance its functionality and appearance with a number of plugins available for it. I'm a little bit sad cause the songbird team stopped support for Linux and focusing on Windows platform, since i'm user of Ubuntu Linux i'm using it. 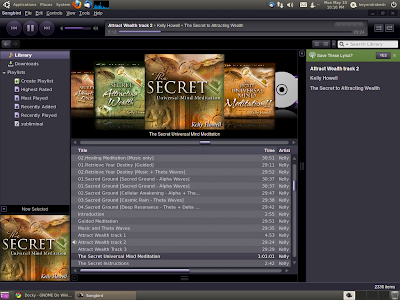 The screenshot above shows the Songbird for Linux version 1.4 on my Ubuntu Lucid Lynx 10.04 and playing a track, when on the right side it displays the lyrics (but unfortunately that track has no lyrics) The iTunes like feature is enabled by installing a plugin called Mediaflow. And above all it is open source application like 'Firefox' meaning you don't have to pay for it. Its completely free and The latest windows version can even play videos. It works great with Windows 7 also. So, all the windows users can try this software.